Pappardella scoops out free gelato on Saturday. JUST A GIRL: Whether you’re in a froth about No Doubt’s new material or a ‘Don’t Speak’ die-hard for life, there’s no denying (the newly reunited) Gwen Stefani & Co. know how to bring it live. Catch them on Saturday at the Nikon at Jones Beach Theater (opened by emo-rockers Paramore and R&B powerhouse Janelle Monáe), 8PM. RAGE AGAINST THE MACHINE: What could be better than seeing Fritz Lang’s 1927 masterpiece 'Metropolis' – as compelling for its dystopian, mechanized-future universe as it is for stunning set design and overall visuals -- on the big screen? Experiencing it with an original score played live by genre-busting 7-member rock collective 3epkano. BAM. Saturday, 5:30, 9pm. 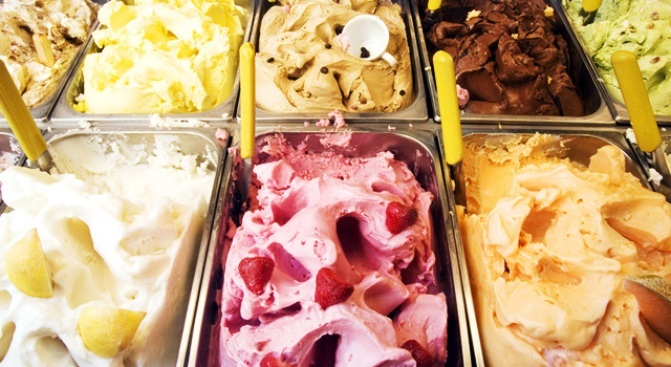 VA BENE: Swampy summer is upon us, but two magical words can cool you down: Free gelato. This weekend, Upper West Side joint Pappardella treats you to scoops of the sweet stuff. Columbus Avenue at 75th Street, Saturday, 12-5 PM. PRINT POWER: Anyone can overshare about their interests in these bloggy times, but back in the day, if you needed to express yourself to the world, you made a zine, which was a hell of a lot more work. The zine scene is still alive and well, and more than 100 publishers will exhibit their ink at the NYC Zine Fest at Brooklyn Lyceum. Saturday and Sunday, 12-7PM. SHORE SING: As the sun sets on Saturday, park yourself outside at the South Street Seaport and enjoy a rich program of live musical selections presented by the New York City Opera – from ‘Candide’ to ‘Carousel’ to Copland (don’t worry, purists, there’ll be some Verdi and Puccini too) – all for free. (Then swing by Water Taxi Beach for some oysters.) Saturday 7PM.